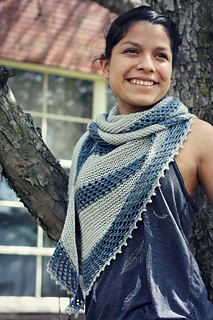 Available as a kit at your LYS and online here. 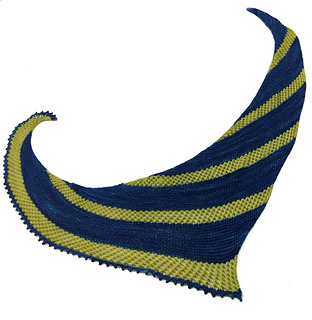 This shawl pattern, part of our Messenger Kit is worked on the bias with a unique asymmetrical shape and mesh striping. 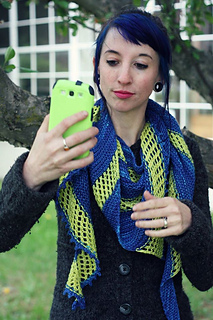 It is surprisingly uncomplicated to knit up. Use one full-size skein of “Mad Hatter” and two mini-skeins (as included in the kit), or choose two skeins of your favorite contrasting colors of Mad Hatter. 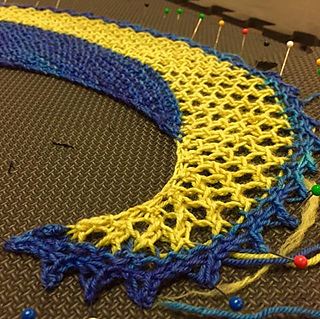 Work the full pattern for a large shawl, or omit the last repeat for a shawlette. 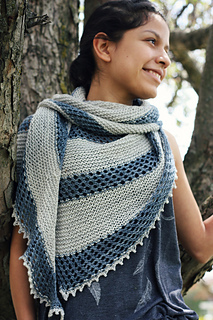 The photo, at left, of the shawl laid out is the smaller version. Measuring approx. 50” (blocked) up the picot edge. 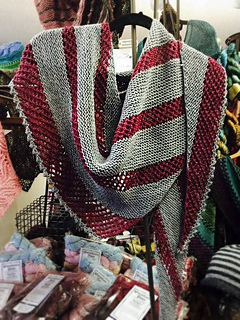 The larger version has one more repeat of garter and mesh.